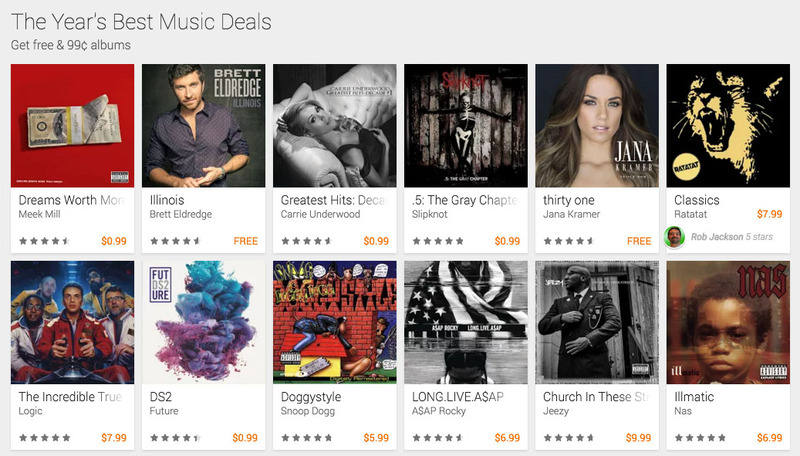 Google is currently offering up “The Year’s Best Music Deals” through a promotion on Google Play that features a handful of free or $0.99 albums, along with dozens of others that are $10. The free and super cheap ($0.99) list includes everything from country to hip hop, so you shouldn’t have trouble finding something you’ll like. Carrie Underwood Greatest Hits is on there, as is Future’s DS2, Skrillex and Diplo’s Jack U, G-Eazy’s These Things Happen, and Jana Kramer’s thirty one. The less-than-$10 list includes artists like Michael Jackson, Nas, Snoop Dogg, Bieber, Billy Joel, Kenny Chesney, Lauryn Hill, and others. The sale on all of this goodness is likely only temporary, so don’t hesitate.